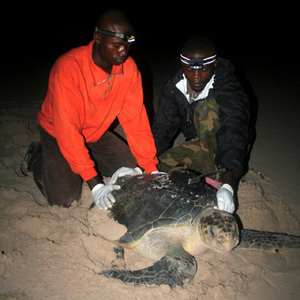 Wildlife Conservation Society researchers Edgard Pemo-Makaya (left) and Junior Makanga-Bahouna helped fit 18 olive ridley sea turtles with satellite transmitters in order to follow them to and from their nesting beaches in Gabon. Photo by Sara Maxwell. Satellite tracking of olive ridley sea turtles off the coast of Central Africa has revealed that existing protected areas may be inadequate to safeguard turtles from fishing nets, according to scientists at the University of California, Santa Cruz, the Wildlife Conservation Society, the University of Exeter, and others. Scientists involved in the study recommended the extension of a marine park on the coast of Central Africa and better international cooperation to manage this threatened species. The study was published May 11 in the online journal PLoS ONE. First author Sara Maxwell, who led the study as a graduate student at University of California, Santa Cruz, said it provides novel insights into the movements of olive ridleys and how to better protect them. "Thousands of olive ridley sea turtles are caught every year in fishing nets along the coast of Central Africa, yet we previously had no understanding of their movements or what areas are critical to protect their populations," said Maxwell, now a postdoctoral fellow with the Marine Conservation Institute. In the first comprehensive tracking study of olive ridley sea turtles during the nesting season, the authors used satellite transmitters to follow 18 female turtles during their journeys ashore to lay eggs. The nesting season brings the turtles closest to the coastline and to the danger of being captured in fishing nets. Turtles were tagged in Mayumba National Park, a 900-square-kilometer marine protected area on the southern coast of Gabon. Mayumba National Park and Conkouati-Douli National Park just across the border in the Republic of Congo were created to protect both olive ridley and leatherback sea turtles from fishing nets, but dozens of dead olive ridley sea turtles have continued to wash up on the shores of the park every year. These deaths have perplexed park managers and resulted in mounting concern about the health of this threatened species. "What we found, however, made sense," said coauthor Angela Formia of the Wildlife Conservation Society. "Turtles were regularly moving outside of the park boundaries where we believe they were encountering fishing nets and drowning, and later washing ashore where we would see them." The study revealed another critical finding: the tagged turtles spent more than half of their time in the Republic of Congo waters, highlighting the need for international cooperation to protect this species. The Wildlife Conservation Society is now working in conjunction with the national park agencies of both countries to join and expand Mayumba and Conkouati-Douli National Parks, creating what is the first international marine park in this region of the world. "The proposal to combine and extend the protected areas will be incredibly effective," said coauthor Brendan Godley, professor at University of Exeter Cornwall and coordinator of the Marine Turtle Research Group. "We estimate that 97 percent of the most critical habitat for this population of olive ridley sea turtles would fall within the expanded park boundaries." "Our results clearly provide a solid foundation for the implementation and extension of the transboundary marine protected area," said coauthor Michael Coyne, director of the non-profit SeaTurtle.org, which hosts a website where the sea turtles can be followed online by the public. Studies such as this highlight the critical importance of international cooperation in managing and protecting long-lived and migratory species such as sea turtles, Maxwell said. This work also demonstrates the power of satellite tracking technology to show where animals are going and how to better protect them. "This is a great example of how innovative science on the ecological needs of wide-ranging, long-lived marine species can help justify regional collaborations for effective conservation," said coauthor Dan Costa, professor of ecology and evolutionary biology at UC Santa Cruz. In addition to Maxwell and Costa, the authors of the study include Greg Breed and Barry Nickel of UC Santa Cruz; Junior Makanga-Bahouna, Edgard Pemo-Makaya, Richard Parnell, and Angela Formia of the Wildlife Conservation Society; Solange Ngouessono of the Agence Nationale des Parcs Nationaux, Libreville, Gabon; Brendan Godley and Matthew Witt of the University of Exeter; and Michael Coyne of the University of Exeter and SeaTurtle.org. This study was made possible through funding and support of the Disney Worldwide Conservation Fund, the UK Darwin Initiative, the Tagging of Pacific Predators Project, UC Santa Cruz Center for Integrated Spatial Research, SeaTurtle.org, and the Gabon Sea Turtle Partnership, which is funded by the Marine Turtle Conservation Fund (United States Fish and Wildlife Service, U.S. Department of the Interior).